Crispy Cabbage Onion Fritters/ Pakoda's. A quick and an easy tea time snack. In a bowl , mix all the ingredients with the chopped onions and cabbage by sprinkling very little water (sufficient to make the flours stick to the onions and cabbage). Mix them well until they have a crumble texture. Heat oil in a pan, using your hands take a small portion from the batter , drop them in oil. (Sprinkle the batter while you drop in oil, so that all ur onions and cabbages gets separated while frying ). Deep fry them until they turn golden brown. Drain them in kitchen towel to remove the excess oil. Very crispy pakodas Aruna..pakkura pothey yeduthu saapidanam pola irruku...fantastic dish! Looks very nice and crispy!! Looks very crisp..long strips od cabbage look yum. recipe is really nice and looks very crispy..
நல்லா மொருகலா அருமையாக இருக்கு அருணா!! Looks superb and so crisp!! Looks so crispy and yummy, like to have some of those with tea. Looks crispy and delish Aruna..Perfect for a rainy day snack.. Very crispy !!! Would be a great evening snack..
Crispy and yummy fitters..looks so tempting. Yes indeed very crispy fritters.looks really nice. very crispy and perfect for this monsoon season..
That luks amazingly crispy...love it. 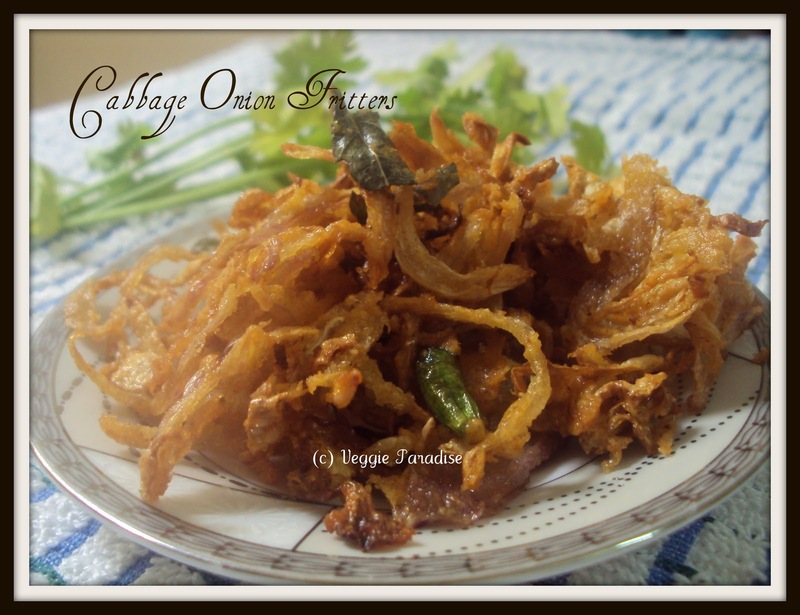 crispy and delicious looking fritters..perfect with hot cup of tea..ahh..
Nice and delicious cabbageonion fritters. The pakodas look sooo crispy and delicious! I'm craving pakodas so badly... I'll have to make these tonight. 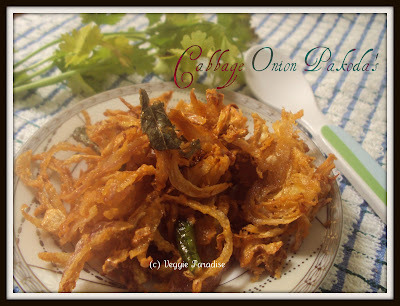 Love the idea of adding curry leaves to the pakodas...will try adding these when I make them tonight. Crispy and yummy fritters..Love the pics, Aruna..
Nice and crunchy pakodas...mouthwatering..never tried with cabbage..next time we'll use it..
Crispy and crunchy. Love the pictures. These pakodas are tempting me to grab some. Yum Yum with me cuppa tea! crispy pakkoda.........:) with Tea pramaathamaa irukkum. Any one who hates cabbage will not hesitate to eat this delicious and crispy pakoras.. Looks yumm and inviting Aruna..